Is there any reason Ideale saddles are selling for much more than Brooks? Are they of better quality, and who rides one and your thoughts? Just scarcity I think, Mike. Some of the prices they're asking on ebay are tres ridiculou' , however. Wow! I'm kinda glad to hear it, since I own one. :) I took it off a '70's Sentinel Whisper. Ideale, unlike Brooks, is totally out of business, so the supply is strictly limited. Except for the fact that they were competitive with (and some would say superior to) Brooks in the day, and share a construction style, there is no comparison. Vintage Brooks are very similar to modern Brooks, so a buyer looking for a saddle to ride can be best off buying a new Brooks, even for a vintage machine (as distinct from a classic of modern manufacture). But a vintage Ideale as a user saddle is a rarer bird, since all possibly available product are perhaps 25 or more years old. Some Ideales are in high demand because they are the correct replacement for certain vintage (back to the 1930s) randonneuses and other sorts of French audax or distance bikes. It's a collecting fringe totally unto itself. But the vintage French geeks will pay for the saddle model they need, because they do need it. Just supply and demand. I have a Model 92 Daniel Rebour Diagonale that I bought new in 1984 or so, and I've seen comparables anywhere from $500 down to $25, all seemingly in similarly good condition, and few better-looking than mine. But I like it and ride it on my UO-8. Worth more than the bike, but ... so what? Can someone make some measurements for comparison??? I will do that later tonight. Mine is an Ideale 90, I think. I think measurements of most, well...some, models can be found on the Classic Rendezvous Ideale page, if interested. I want me one of those 92's, but can't quite swallow hard enough on the prices. Hard to compare leather saddles because each one is a bit unique. For example I have two brooks saddles one I get along with and one I don't! I have a few Ideale in a box, unfortunatly I have had to sell over the years. Very nice saddles which should end up one builds this winter. This is an 80 or an 88 that was left under a saddle cover on a rusty bike. Saving it for fun old build. The marking on the seat is the mark of daniel rebour. He tapped in the saddles to soften them up before they were used. nice ideales, prettyshady. Unfortunately my one Ideale is a wall saddle only. A worn alloy-railed type 54, or type 59 (I can't read the embossing fully) with a fatigue crack in one rail near the nose. Beautiful Ideales prettyshady. I especially like the Professional. Frank Berto wrote a book about upgrading your bicycle, and in it provided measurements of a few Ideales. The 92 shared width and length with the Brooks B17, and the 90 was very similar to the Pro. There were less than a dozen other models of Brooks, and more than a dozen other models from Ideale. What measurements would you like to see? Frank did length, width at widest point, and width at 50% length. I've used both my 92 and a B17, and find the B17 a little flatter and a little narrower at the 50% point. I've never had a 90 or 80, which are more comparable to the Pro. I have an Ideale Professional which I find to be extremely comfortable while I cannot say the same about the Brooks Professional as it is narrower than mine.. I have wide sit bones for a guy so really narrow saddles do not work for me. Also have a 60 which is also extremely comfortable. I've ridden one Ideale on my '83 Paramount quite extensively and find it rides just fine. I was able to pick up this NOS Ideale a couple of years ago for about $35 shipped. It was a bargain. The Ideale 80 on the Paramount. Just a couple of years ago, used Ideales were selling for less than comparable used Brooks saddles on eBay. But with the whole Velo Francais revivalist movement (which includes the requisite use of vintage or NOS TA cranks and MAFAC brakes on so many new bike builds), Ideale prices have taken off. I had an Ideale with alloy rails (Model 80?). It was on a '75 Raleigh Gran Sport. Absolutely hated it. Someone in Japan paid stupid money and I replaced it with a garden variety Wrights. Later sold the bike to someone who had to have it because it was Nouvo Record equipped. Currently on ebay there is a seller or two who have placed extreme prices on some Ideale saddles, and they sit there. But they do seem to push the actual sales higher than what they have been prior. I like the 90, owned one, sold it long ago , bought another for a French bike a number of years ago. I have not bought any more as I have not been able to stomach the prices, but I will admit over time I have only periodically looked in on ebay listings. I had a really nice Ideale 90, and she was a beauty. But, a little too wide and flat for my tastes. I prefer Brooks Pros and B17 Narrows. They are some of the best saddles, I have them on my French bikes and can say the ride is amazing. I have a NOS ideale 90 waiting for the right french bike to show up on my doorstep one of these days. . . I just installed it on my Bianchi, it sat for 5 years without use. I think using it helps keep it from drying out. The generation after the fixie hipsters are building bikes formulaically. They go online and let their peer group tell them what is kool kit, as most don't understand what is good kit, and then they buy that. This generation doesn't build a bike to ride it and appreciation it for what it is, they build it to post it on social media so that that same peer group can appreciate what they built. Once you understand that mentality it all makes sense. As for me I hate Brooks saddles. They make my willy go numb. I sell every Brooks and Ideal that comes on bikes I buy. I love that these lemmings keep paying enough for these saddle to let me buy better ones. 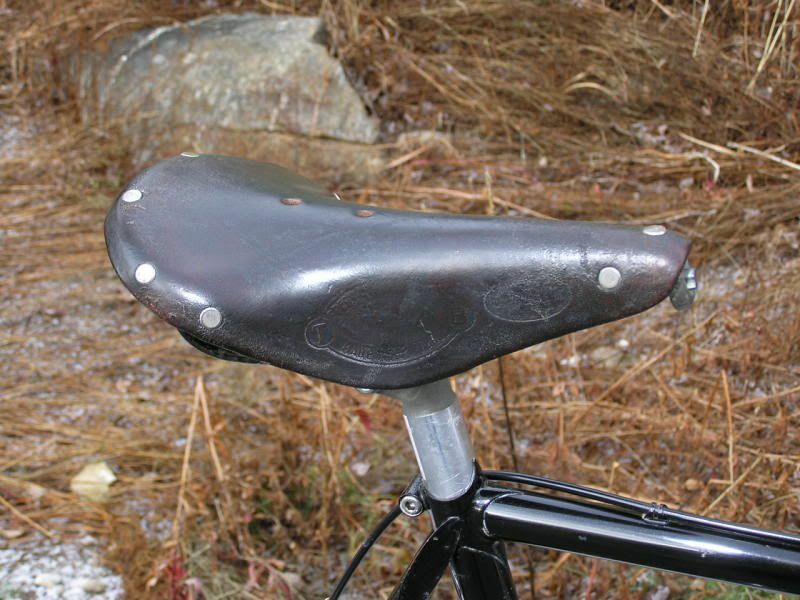 I'm loving Selle Anatomica right now. Perineal blood flow cutouts and the most comfortable saddles most people didn't know existed. Even though you can get them with copper rivets and they look "ideal" on a randonneur or Cannondale STish build (these were in production before Grant would start at Bridgestone let alone Riv, so I'll never all these BOBish bikes, but what they really are...Cannondale STish bikes), they are just damn comfortable saddles. Whereas I'm convinced that with Brooks many people tolerate how uncomfortable they are because they like the "look." Cannondale on the epic '86 ST 800 bikes used both Brooks and Ideal saddles, and also on other STish builds. I never understood if they just liked both, or whether Brooks couldn't' accommodate production or what. Then again C'dale is the company that rewrote all the rules (steel…schemeal, we'll write a new paradigm!) and they would speck bikes with Superbe Pro, Nitto, Campagnolo, Shimano Dura-Ace and Ultegra, really the best kit they could find, followed by the bet price point builds they could negotiate. Who knows, maybe they used both for the mere purposes of negotiating power. Supply and Demand. They aren't making more Ideale saddles, and you can always find a used Brooks for sale after someone visits their urologist. I have an Ideale 90 on my Bilenky. I was given three of these when a riding chum started to clean his shelves. Two of them had seen very, very light use. The third was well loved, but still had some hours of available use. I had pictures of these saddles on my Flickr and I was contacted by a fellow in Brazil about their availability. Yep, the one that was well worn. He put it on a Jo Routens and the pics look outstanding. FWIW I have taken the Bilenky on trips of 650 and 250 miles this summer. The Ideale 90 was on both of these trips and was super comfy. I used to get Ideale saddles much cheaper than Brooks. I'm particularity fond of their #42 . Yeah I use proofide on it from time to time but agree that sitting too long is not a great thing.